I started reading The Sea and Sardinia by D. H Lawrence about 3 years ago and kept putting it down. 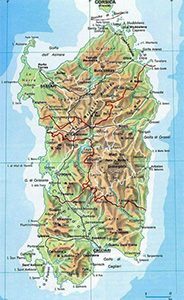 It was a travel memoir written in 1921 and described the island’s landscapes and local people along his way thru Cagliari and Nuoro among other villages of that time period. I also read Cosima and Reeds in the Wind by Grazzia Deledda, another famous Sardinian author to get a feel for this bucket list destination to this mysterious Italian island I hoped to visit so long ago. None of these reads gave me any hint of unusual lifespan. 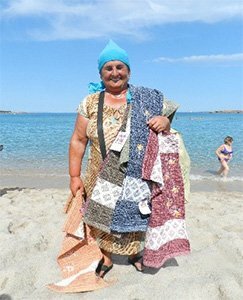 So I decided to take a look at the overall Sardinian lifestyle and note what is there on this island that might stand out in its contribution to a longer life. 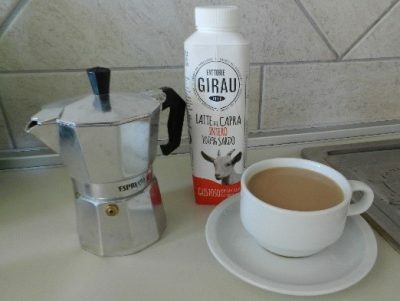 Here are my first hand experiences and impressions. 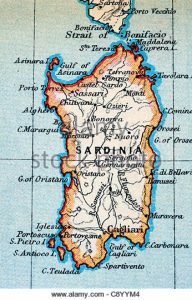 Friday, August 11, 2017 – We flew into Cagliari, the largest city and capital of Sardinia where the car rental was our first priority. The Alfa Romeo 6 speed manual sports sedan put a wide grin on Nestor’s face until we started driving on the wild serpentines of high roads. We finally got used to every single Italian driver on your rear end within moments of their appearance that first day. I guess driving fast is a way to relieve stress on these long bouts of curvy roads as well as the beautiful views. Once you reach a town, many bands of men of all ages were seen sitting around the cafes sipping wine in the afternoon. Perhaps this too was a stress reducer. Our first stop was VILLA GRANDE STRISAILI, one of the areas where clusters of longevity was documented as a Blue Zone where natives, mostly men on this island, live over 100 years. 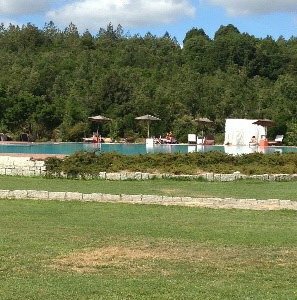 Our Resort Orlando was a lovely haven nestled in Barbagia , a mountain area of inner Sardinia. 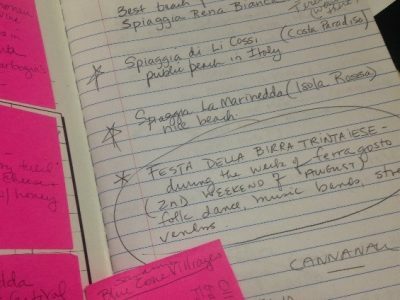 I did my homework and had notes on a few nearby towns that might have festivals in August. Olienta and Nuoro were two towns we chose to scout out tomorrow looking for signs of happy aging. The most unusual and strange experience was that there were NO SOUNDS where we were staying. A twilight zone lacking the circadas, no cacophony of tree frogs or night birds or any sound at all. I strained to hear something of the night and settled for my own breath sounds as I fell fast asleep. 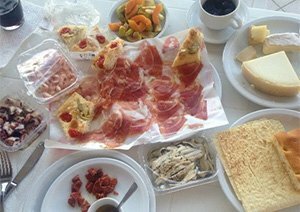 Day 2 – Saturday, August 12 Prosciutto, Carta da Musica ( a thin crispy bread like music paper) yogurts, eggs and blood orange juice was breakfast that morning. We set out early –on a wild goose chase that our concierge sent us on. I stopped for directions and witnessed a most sincere attempt by a local woman to explain where to go with more arm movements than words. 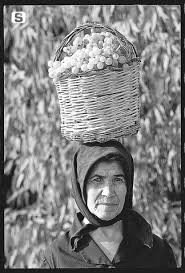 Here we watched an old crone balancing a basket on her head pass by and how I wished I captured this photo. This original one was regrettably only imprinted in our minds. The drive from Villagrande progressed through a land that reminded me of Arizona except more mountainous. 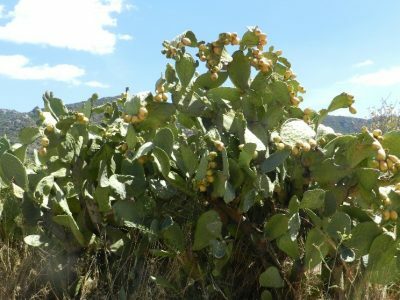 I have a natural affinity to search for unusual plants that might be indigenous to the land and I had 3 such discoveries interspersed amongst the diverse habitat of the island: the prickly pear cactus, myrtle berries and the Cannonau grape. 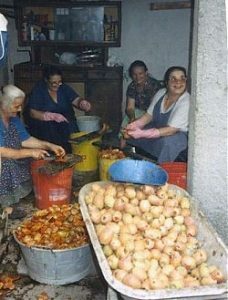 ….production of sapa di fico d’india, the concentrate of prickly pear pulp which the local women have been boiling down and selling for years. Witness the picture on the upper left. It’s from 1989. We happened to be prowling the streets when we spotted the wheelbarrow full of prickly pears in front of a magazzino and popped in for a chat with the women, whose iron fingers were expertly ripping the skin off the prickly pears like they weren’t prickly at all. Sapa di fico d’india was sometimes a substitute for sapa di mosto d’uva, that is, concentrated grape must, also used in cooking by the poor. Sugar wasn’t always dirt cheap, you know. The Cannonau De Sardegna was everywhere! 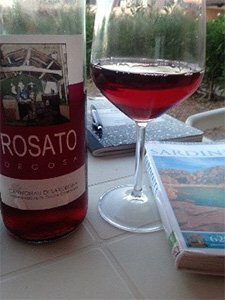 In the US there is one brand I tend to buy for my friends who are having a birthday and I wish them “a hundred years more!” Here in Sardinia this type of grape flourishes, is widely enjoyed by the Sardinians themselves, and accounts for one in every five bottles of wine made on the island. And the locals there easily live into their 90s and in many cases till over 100. It may well be the wine that’s doing it. 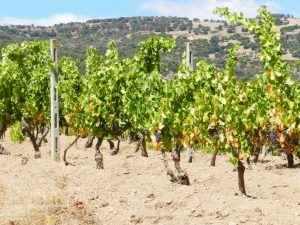 Buettner pays particular attention to Sardinia, its dense, tannic red wines and healthy diet. 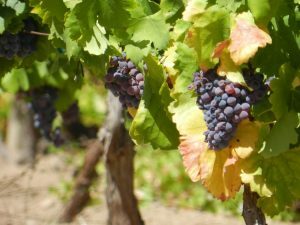 Cannonau – or Grenache, as it is known in France – develops thick skins on Sardinia, which provide anthocyanins and polyphenols in abundance. These compounds have been linked to heart health because of their antioxidant effects and, when taken in moderation, can help you live longer. Biochem Pharmacol. 2013 Jul 1;86(1):138-45. doi: 10.1016/j.bcp.2013.03.024. Epub 2013 Apr 9. 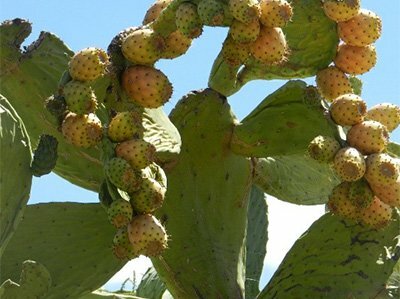 It is thus likely that the effects of Sardinian wine extracts against intestinal inflammation induced by dietary oxysterols are mainly due to their high phenolic content. Cannonau wine has two or three times the level of artery-scrubbing flavonoids as other wines. 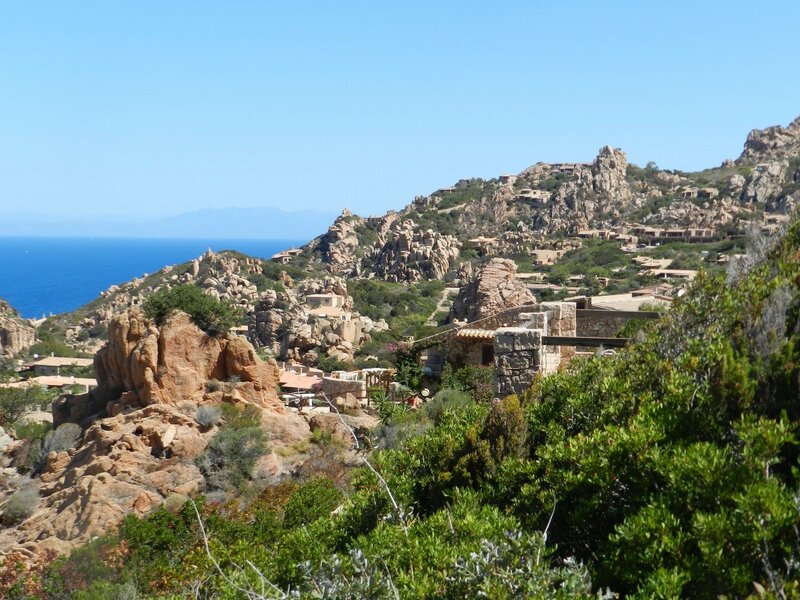 Continuing in our exploration mode, the plan was to get to OLIENA, one of the Sardinian Blue Zone villages, and proceed back taking the coastal route . Though there were delightful views over this undulating countryside little did I expect to drive through NUORO, ORGOSOLO, OLIENA where we stopped and enjoyed some authentic pizza then continued our trek to DORGALI, CALAGANONE to TORTOLI all in the same day! We stopped at a roadside Formaggio (=goat cheese) place where we ran into an English speaking roadster from Florence who helped us pick out the best fresh goat cheeses, Cannonau Rose, and local honey. While there are more than 30 types of cheese produced in Sardinia, Pecorino remains the most popular. 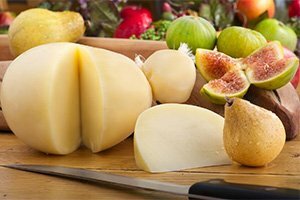 In fact, 80% of Italy’s Pecorino Romano cheese comes from the island of Sardinia. We went for one of the goat cheeses (we think) sided so well with the abundant green figs that were in season and wildflower honey to dip into. 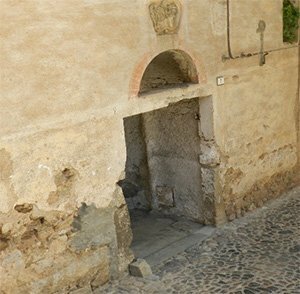 After researching Formaggio, I was grateful that the friendly Italian didn’t suggest the stinky, rotten cheese (Casu marzu)that is sometimes considered a delicacy. The one we tried was just delicious! I tried to take a jar of the spreadable goat cheese version back home (to US) but I am a poor smuggler and packed wrong. 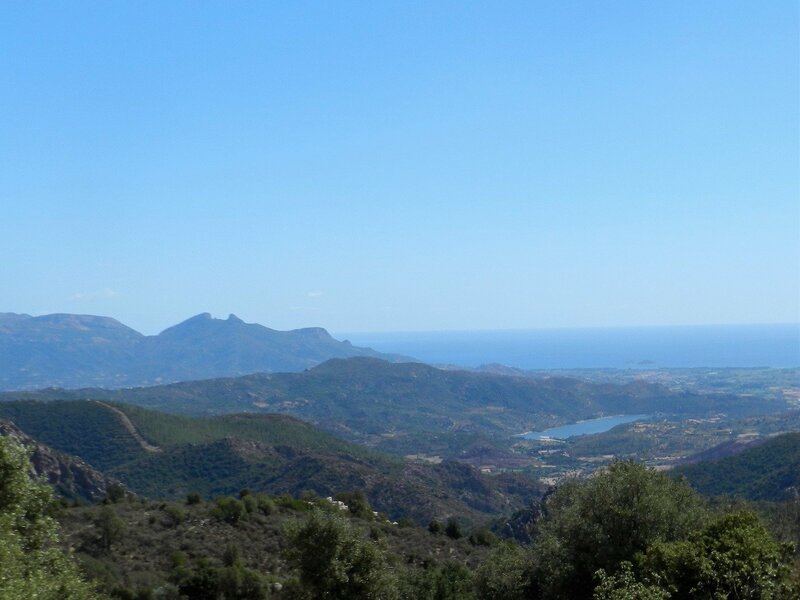 The drive back was through a beautiful mountain village, BAUNEI, then thru GIRASOLE, LOTZORAI and went around in circles looking for a place to dine. Drove to ALBATOX on the coast looking for a seafood restaurant with no luck. To our surprise, we found out that the Italian Rule for dinning is basically 12-3PM and 8PM to 11. We were dumbfounded! So we grumpily headed back for VILLAGRANDE STRISAILI and found the Santa Barbara restaurant which had happy hour going on at 6 so we sipped our 1.50 euro beers and played some fussball. Dinner at the Orlando restaurant included Wild Boar and SEBADAS- a traditional thin pastry filled with mild cheese and topped with honey- on my list of Sardinian desserts and highly recommended! 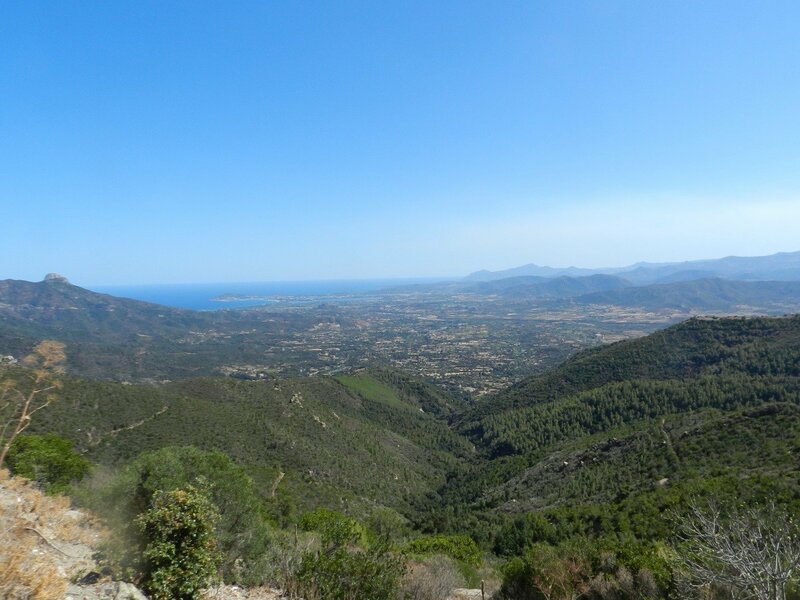 Day 3 Sunday, August 13 – I woke up with a stiff neck – more like a whiplash after driving yesterday for 5+hours through the meandering roads and canyons of Eastern Sardinia. We found out we actually drove through Gorropu canyon seen from the Dorgali road. 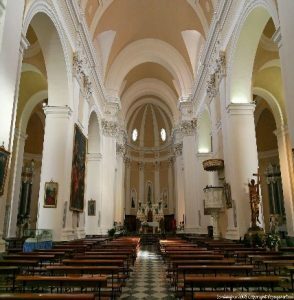 We went to Church at the Basilica St. Maria in Nuoro and felt good to take a break. From here we drove towards TEMPIO PAUSANIA for a great lunch of gnocchi and fresh tomato sauce at the Museum Restaurant. We continued toward the west coast thru AGGIUS: toward TRINITA d’ AGULT and finally North to COSTA PARADISO! Our next stop the Gravina resort. 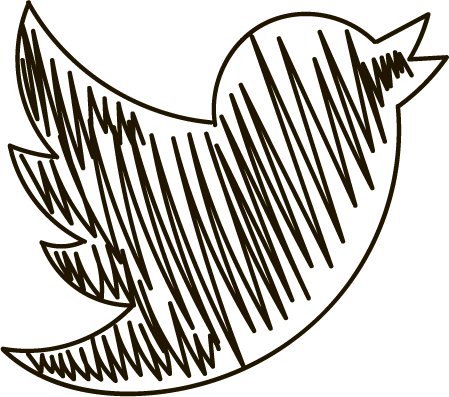 Day 4 – Monday August 14. The Gravina Resort was a village of villas built into the craggy coastline that overflowed inland. It was a short ride from many pristine beaches both sandy and rocky. The rocky ones were a bit challenging since you had to sit down and slide into the ocean like a crab. Interesting experience and even more fascinating to watch others doing this. Another unusual sight on the beach was this guy selling Coca leaves. I researched this practice of chewing coca leaves and it does not have much to do with cocaine. Basically, claims are made that when chewed, coca acts as a mild stimulant and suppresses hunger, thirst, pain, and fatigue. Perhaps this should be factored into the longevity formula? 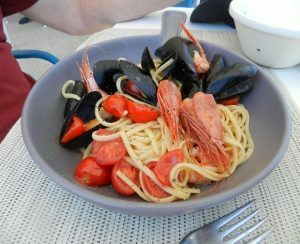 The food was just wonderful at all of our lunch spots and though I did not intend for this little story of our Sardinian experience to turn into a food blog , I must continue to show photos of a few of our great meals. After swimming at the Spiaggia Rena Bianca in Santa Teresa, The Spiaggia La Marinedda in ISOLA ROSSA and the Spiaggia di Li Cossi in COSTA PARADISO we came back to our villa to relax by the pool and apres with a variety of goat cheeses, honey, green figs, proscuitto, focaccia breads and thin wafer crackers , octopus, and even a Rose Cannonau wine. 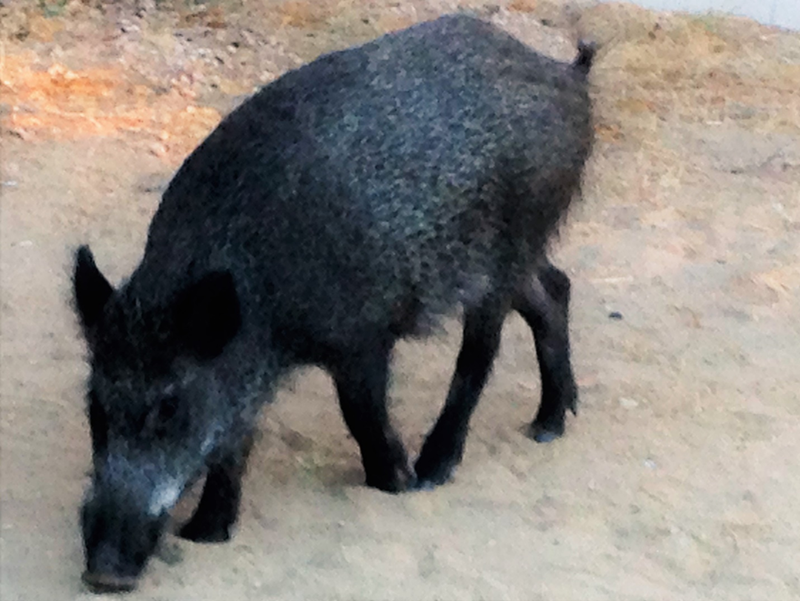 On our third evening we had this novel visitor – probably looking for scraps of our delicious suppers. My big question at this fantastic island surrounded by unspoiled waters: Where are the Sardines?? We know they are loaded with natural Vitamin D and surely must contribute to longevity and health?? 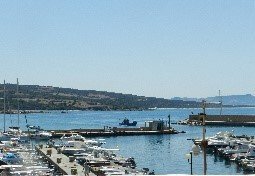 Well they were nowhere to be found even in this port town of ISOLA ROSSA, where boats come in with the catch of the day. But NO SARDINES –anywhere!! “ Maybe Tomorrow” was always the answers when I asked at the Peschetarias. 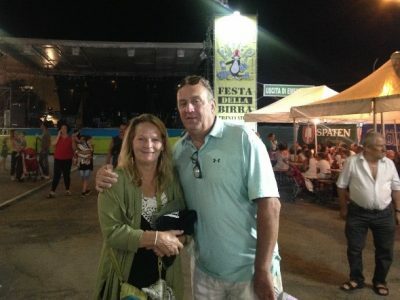 On a streak of good luck and as a finale of our visit, we ventured out on our last night to the festival at FESTA DELLA BIRRA TRINTAIESE which was on my list from the beginning. 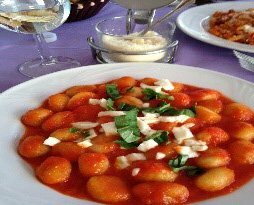 This event, scheduled during the week of FERRA GOSTO (Ferragosto is an Italian and Sammarinese public holiday celebrated on 15 August, coinciding with the major Catholic feast of the Assumption of Mary) was just a few miles from our resort! Music bands, street vendors, craft beers. The sausage on the Italian Roll was one of only 2 items on food menu. The other was called “patatine fritte” translated to your simple french fries. Not exactly authentic Sardinian cuisine but a great venue to visit! So what secrets have we uncovered in this Land of Noted Longevity? 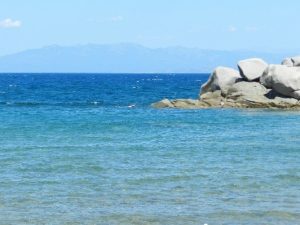 After reviewing all photos of the magnificent tones of turquoise, alluring pools of sapphire, beautiful shades of cerulean ocean, crystal ultramarine waters surrounding and infiltrating the deep caverns of the Sardinian Island – vibrating like an azure blood pulse – I could see it to be a true Blue Zone. 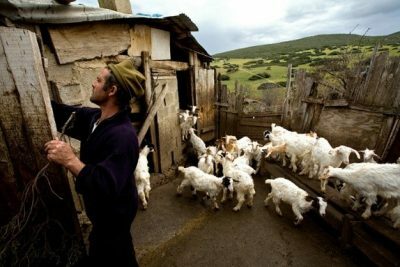 It’s a heavenly place abounding with natural wild foods that are not watered down or genetically modified as are not the people who reside there for centuries.